Rules requiring MPs to register donations twice should end by July, the Commons standards watchdog has said. Plans to end the requirement to inform both the Register of Members' Interests and Electoral Commission of donations are to be put to MPs. 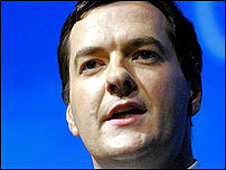 Shadow chancellor George Osborne is among those to have fallen foul of the so-called "dual reporting" rule. The Commons standards watchdog said it had been an "unintended consequence" of legislation and had led to "confusion". It has put forward proposals to allow MPs to report all donations of £1,000 or more, and loans of more than £200, to the Register of Members' Interests only - in the latest revision to the guide to the rules on MPs' conduct. The Electoral Commission would then extract the information it needs from the published register. It will mean more details have to be provided to meet the commission's requirements but will mean a "significant reduction in the administrative burden" on MPs, the Commons standards and privileges committee said. It also means some benefits which have not been required by the members' register - like parking passes and visits paid for by the British Council - will have to be registered, if they exceed £1,000. In its report on the new rules, which must be approved by MPs, the committee said dual reporting had been an "unintended consequence" of the Political Parties, Elections and Referendums Act 2000, which it had been trying to change since 2006. It said: "We see no reason why dual reporting should not have ended by the end of June at the latest." Last year the Commons standards and privileges committee upheld a complaint against Mr Osborne over £487,000 in donations that were not entered into the Register of Members' Interests. But it said it "would not be fair or reasonable to criticise him" as the money had been declared to the Electoral Commission. The money had been given to Conservative Central Office and declared to the Electoral Commission before being transferred to fund Mr Osborne's office. The revised rules also state that donations should be registered whether they are given to an MP directly or via their party's main organisation. Health Secretary Alan Johnson also faced questions over more than £3,000 in donations to his deputy leadership bid, which appeared on the Register of Members' Interests but not the Electoral Commission list. He said his team had declared the money but later noticed it was not appearing on the Commission's website.